The most common household fleas are cat fleas but are also common on dogs and birds.. The cat variety are reddish brown and about 2mm long. The bites are very irritating and can lead to eczema. If your pet is affected, it’s likely that its bed is host to thousands of tiny larvae. 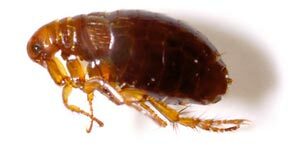 Fleas don’t live on humans but can often bite ankles and lower legs.